The next major update to Windows 10 is coming in September. 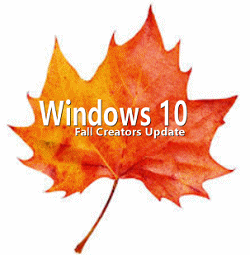 It is now officially called the “Fall Creators Update”. It will be released worldwide on October 17, 2017. 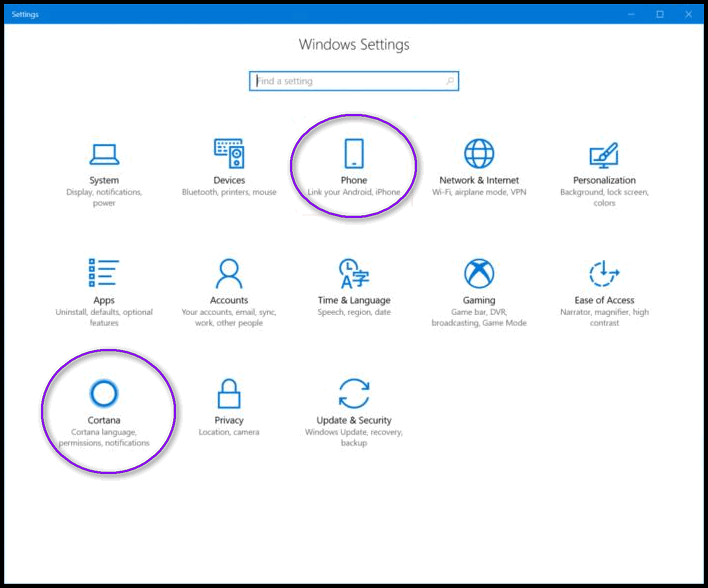 In the Fall Creators Update, Microsoft continues its assault on Control Panel, adding two new categories to Settings. As you can see below, they are Phone and Cortana. According to Microsoft, you’ll be able to easily synchronize your Apple iPhone or your Android phone with your Windows 10 PC. You’ll be able to do this from Settings / Phone. Whether you love or hate Cortana, Microsoft continues to improve it (her?). In the Fall Creators Update, you’ll be able to speak commands to Cortana. Cortana will be able to lock, sign-out, restart, or shut down your PC with voice commands. Additionally, if you ask Cortana a question it does not know the answer to, it won’t automatically open Edge and the Bing search page. You’ll be given multiple answers and choices in a fly out. If you’re a fan of Windows Movie Maker, you should really like Windows 10 Fall Creators Update’s Story Remix. Select your photos and videos, drop in music, and select your desired transitions 3D effects and Click a button. Voilà – there’s your video. Originally, Story Remix was going to allow you to drop 3D objects into your videos, but this feature will be delayed until the next update. The start menu and Action Center will have a new “Acrylic” backdrop. There will be (by default) a My People Hub on the taskbar. You’ll be able to pin up to 3 contacts to the taskbar. Any of your pinned contacts can send you “Pops” – which are essentially animated emojis. The Notification area’s Battery icon will have a new flyout with a slider that will allow you to better control power consumption to extend battery life. Start menu’s “About” section will contain information about your system’s health. 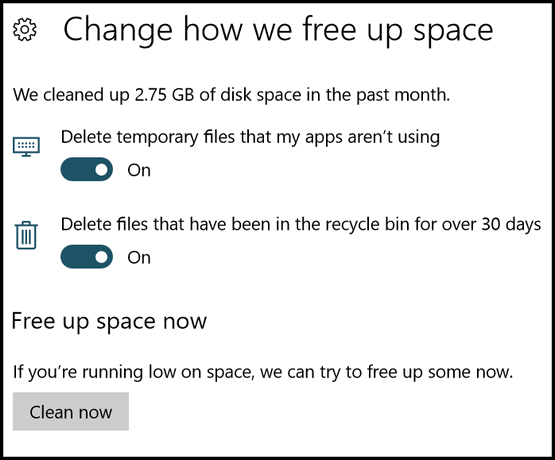 You’ll be able to set Windows 10’s “Storage sense” to automatically delete the contents of your Downloads folder every 30 days. Remote Desktop is now included in Settings. You can recover your Microsoft Account password directly from the lock screen. Windows will be able to throttle inactive programs so they don’t use system resources. Many new improvements are included in Microsoft Edge. One new feature we were really looking forward to was something called “Timeline”. Timeline lets you jump back in time to find what you were working on, whether it was 2 hours or 2 months ago. Easily hop back into your files, apps and sites as if you never left. Unfortunately, this feature will not be included in the Fall Creators Update. Keep in mind that over the next month, more features could be added and/or some features removed and or renamed. I guess I’m getting old. I don’t need all those bells and whistles. Just more things to go wrong. I’m not against technology ….just not ready I guess to “jump in”. I did have Windows 10 but had to restore back. Windows 8.1 is what I’m sticking with for now….it’s a breeze compared to Windows 10. YAY! Many of these new features are things that have been needed for a long time. I look forward to getting the new updates! WHY would I – or anyone – want Windows 10’s “Storage sense” to automatically delete the contents of my Downloads folder every 30 days? WHY? WHY?? WHY??? That better not come as default. Right now I am not happy with Microsoft after Creators update broke my favorite – basically only-used – digital scrapping program. Don’t like that it broke my solitaire games, either, but I had expected that. Hard to believe but I am actually thinking “Apple”. So sad. I don’t see that option, all I see are deleting temp files and recycle bin. Additionally, the Downloads folder (generally) is where downloaded program installers are saved by default (this location can be changed by the user). After the program is installed, those files are not needed. If the program does need to be reinstalled later on, it’s always best to re-download it, that way you know you the most current version. You shouldn’t blame Microsoft because the developer of the software you like does not keep the program you like up to date. Microsoft makes developer versions of new Windows 10 versions available months before the final update is released. Yes, I realize that this means I would do that myself (unless that became part of some future update) but I personally don’t think that option should be there. I know me so well and I know I can do some silly things and I would regret that one more than I can say. Time to create a different download destination. Obviously I know nothing about pc or software development but it must be an onerous task keeping up with Microsoft’s changing versions. There shouldn’t be anything in you downloads folder (by defualt) other than programs you download. Unless you’re downloading portable programs, there would be no harm in emptying your downloads folder, since any program you downloaded could be downloaded again. I guess I don’t know aht you keep in your download folder that’s irreplaceable.